Medusa: NEWS FLASH !!! RE-AIRING TODAY OF FOX-TV’s “Morning Show with Mike and Juliet” featuring the KIMKINS DIET SCAM !!! NEWS FLASH !!! 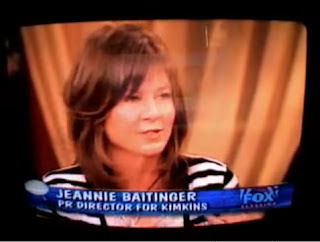 RE-AIRING TODAY OF FOX-TV’s “Morning Show with Mike and Juliet” featuring the KIMKINS DIET SCAM !!! FOX-TV’s “Morning Show with Mike and Juliet," re-aired their feature on the Kimkins Diet Scam this morning (December 31, 2007). "One woman lost 100 pounds and that’s not all — you won’t believe what happened next! M&J take you inside the dangerous Kimkins diet that some call 'Atkins meets anorexia.'" Let's hope the show was updated, advising viewers that Jeannie Baitinger (aka Tippy Toes) has since left Kimkins, and after being granted immunity, is now providing information to John Tiedt, the lawyer for the Plaintiffs in the class-action suit against Heidi Diaz/Kimmer. Kimmer thinks this will bring in more $$$ to her site. Hope she's wrong. I can't imagine watching that segment and coming away thinking this diet is safe and effective. But, I guess some will. All we can do is keep warning folks. You've got to wonder how it makes Jeannie feel to see herself on television over and over again tap dancing for Heidi. That Heidi is, if nothing else, clever. She gets other people to put their own face on the lies so she comes out looking clean. As Mike said, she should have been there to speak for herself. But wait! She was in deposition that day. How convenient. Wasn't it Heidi who rescheduled the deposition for that day? It almost makes me feel sorry for Jeannie. On second thought, nah! People make their own choices. WOW! The M&J show really gets it, if they're re-airing this episode again so soon. I think it's pretty significant that they're airing it for the third time, and at the new year when people are grasping desperately for a way to get their weight down. I wish they'd do an actual follow-up. Maybe that'll come when there is more court action. Considering the Kimkins diet? Read this first: Kimkins Diet Scam Update. Kimkins members may join the Kimkins lawsuit! Here is a video that explains how easy it is to join the Kimkins lawsuit.